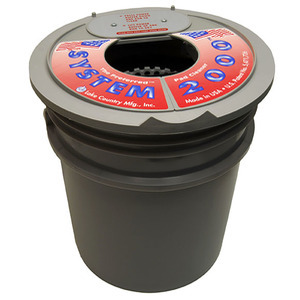 The Lake Country System 2000 Pad Washer is an enclosed pad washing system that cleans and dries used foam and wool polishing pads. 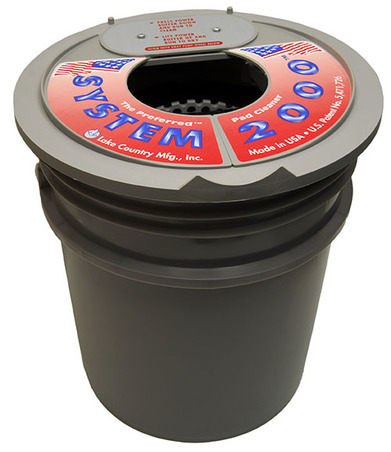 The System 2000 is a revolutionary pad-cleaning unit that cleans and dries pads while they’re attached to the polisher. You simply place your polishing machine and attached pad into the system’s bucket, close the lid and start up your machine. The System 2000 contains 9 separate agitator wheels. 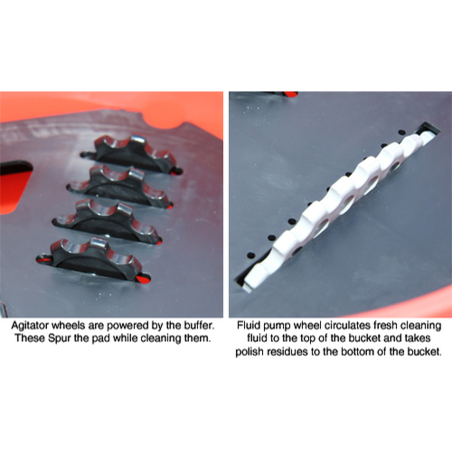 The agitator wheels have teeth that massage the pad to release polish and wax residue as the polishing machine orbits. The agitators are inside the system’s bucket. Specialised lids that close around the buffing machine ensure there is no sling. This pad washing system works with a combination of agitation and detergent. Use a detergent such as Snappy Clean Pad Cleaner. This strong citrus cleaner helps break down polishes so the agitator wheels can better extract them from the foam. The agitator wheels do all the work. You just hold the polisher. 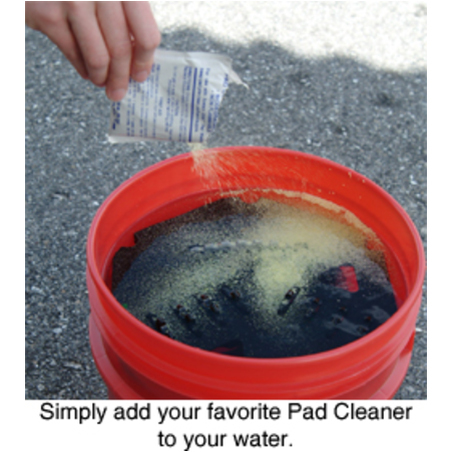 Pour approximately 1 ounce of pad cleaning powder into the bucket and fill it with 3-4 gallons of water. The amount of water may vary according to the height of the pad cleaning plate. The water level should be about 3-4 inches below the top of the pad cleaning plate. Reattach the lid. Place the used pad (while attached to the polisher) in the opening in the lid. Close the lid covers. 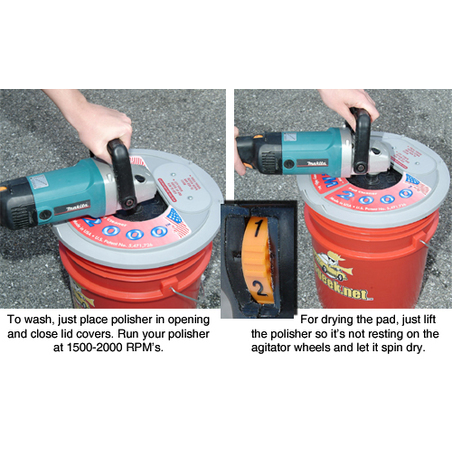 Operate the polisher at a low speed while holding the pad flat against the pad cleaning plate. Set your polisher to a maximum speed of 1500 to 2000 RPM. Slowly rotate the polisher as it runs. To dry the pad, lift the pad so that it’s not resting on the agitator wheels. Rest the polisher’s belly on the cradle on the lid. Tilt the pad slightly so it’s not touching the pad cleaning plate. Continue running the buffer for 15 seconds. Stop the buffer before opening the covers. The pad should only be slightly damp. A few minutes in the sun will completely dry the pad.